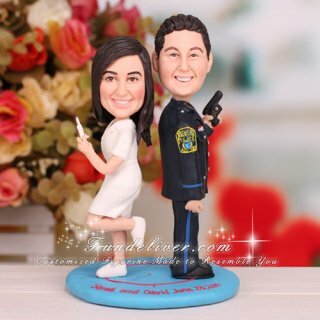 This is a completely customized Police Officer and Nurse wedding cake topper ordered by one of our customers. The groom is a police officer and the bride is a nurse, so they would like their figurine to represent their work life and personalities. They would like groom to be wearing his police officer uniform which has blue strip down pants and around the end of sleeve. The pin on the right side is red white blue (that order stripped with 163 in the white area, it was badge number of groom’s partner who passed). He is holding a black handgun in left hand. They would like the bride to be in her nurse uniform with the white shoes. She is holding a needle in her left hand. They would like the groom and bride figurine to be back to back looking over their shoulders forward smiling, both holding their tools/props of the trade up in their hands like they are dueling. The base is a round with red reticle of his tactical weapon in the center and at edge with their names and wedding date “Sarah and David June 23, 2011” on. Want to add extra personalized police badge with your recent promotion? Or your tactical weapon to reflect your police officer occupations? 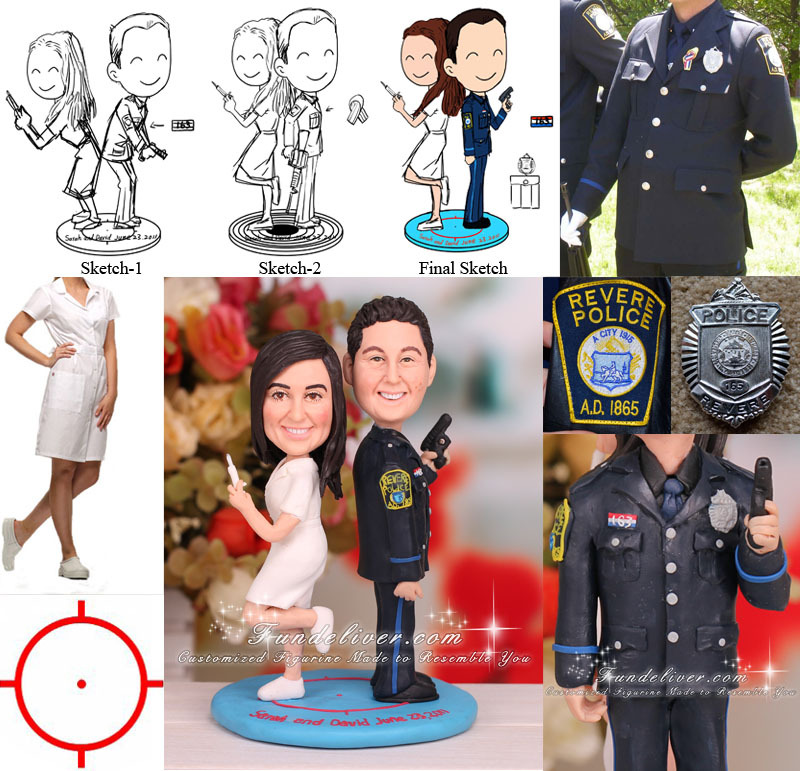 This customized police officer wedding cake topper will be the best choice.